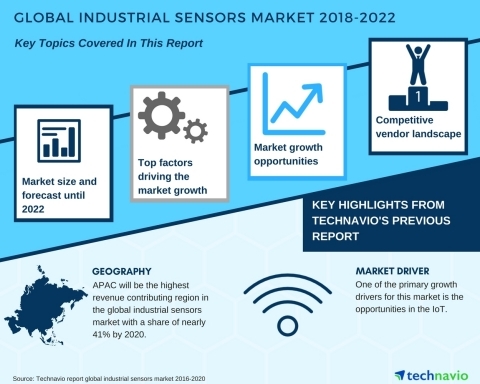 LONDON--(BUSINESS WIRE)--Market research firm Technavio has announced the release of their latest report on the global industrial sensors market. This new report will provide expert market insights for the forecast period 2018-2022. The report will follow up on Technavio’s previous report on industrial sensors, offering an up-to-date assessment of the market in the context of new developments, recent trends, along with an analysis of present-day competitors. The upgraded research report on the industrial sensors market is an integral part of Technavio’s automation portfolio. Technavio covers an extensive range of market research reports on the automation market, covering different regions and top industry segments. Some of the topics include industrial turbocharger, automated container terminal, industrial transmitters, industrial gear motors and drives, and industrial controls and factory automation. Technavio’s previous report on the global industrial sensors market projected that APAC will account for about 41% of the total market share by 2020. Factors such as the presence of a number of developing economies and the recent regulatory standards implemented by countries in this region for commercial and passenger vehicles led to the growth of this market. Technavio’s new report on the global industrial sensors market will evaluate the key geographical regions and their behavior over the past four years, introducing new data and observations and providing new predictions. The report on the global industrial sensors market for the period 2018-2022 is available to order now and will be delivered within one week of purchase. Technavio’s analysts and industry experts will work directly with you to understand your requirements. We offer USD 1,000 worth of FREE customization at the time of purchase. Market research firm Technavio has announced the release of their latest report on the global industrial sensors market for 2018-2022.